This entry was posted on Tuesday, February 12th, 2019 at 11:55 am. 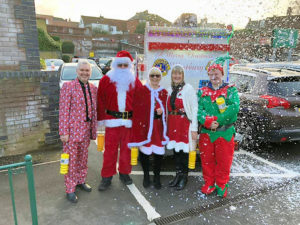 WESTBURY Lions Club raised over £6,400 to support the community during their Father Christmas float, matching last year’s club record. The club reports, “With your donations we have raised over £6,400 this year to support community projects and families in need over the next 12 months, matching last year’s amazing club record! “Although we had to cancel one night due to poor weather, this result is a remarkable fundraising achievement for the town and we are especially grateful to the community for their ongoing praise and support of our float, and the volunteers who work tirelessly to take it to as many homes as possible. “We really couldn’t have made it round all those houses this year without the help of a lot of people, so we must quickly try and thank them here: Westbury Rangers for providing support with collectors on nights where our own volunteers were not available; Matt Rowe and the team at Hire Standards for lending us a generator to light the float for the month. His support and generosity allowed us to run reliably throughout the month and he continues to be a valued supporter of our activities.